He came to Minneapolis, Minnesota in 1955. He was appointed Commander of the Royal Norwegian Order of Merit on December 5, 2006, for his outstanding work for Norwegian-American relations over many years. Occupation: Life Insurance Salesman, Aetna life Ins. Co. Occupation: Life Insurance Salesman, Aetna Life Insurance Co.
Sawyer, Liz. "'Quiet Giant' Sabo Remembered." Star Tribune, March 20, 2016. "Sabo Gave His All to Strengthen Democracy." Star Tribune, March 15, 2016. "Martin Sabo, 78, Longtime Minnesota Politician." The New York Times, March 14, 2016, p. A24. Grow, Doug. "Longtime DFLer Martin Sabo dies at 78." MinnPost, March 14, 2016. Salisbury, Bill. 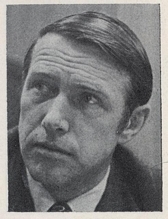 "Martin Olav Sabo, Longtime Minnesota Representative, has Died." Pioneer Press, March 14, 2016. Walsh, Paul. "State Loses a Legislative Giant." Star Tribune, March 14, 2016. Sturdevant, Lori. "Lessons Learned: the Longtime Fifth District Congressman Says He Has No Regrets About Leaving Office." Star Tribune, December 3, 2006. Sabo, Martin Olav. Biographical Directory of the United States Congress.